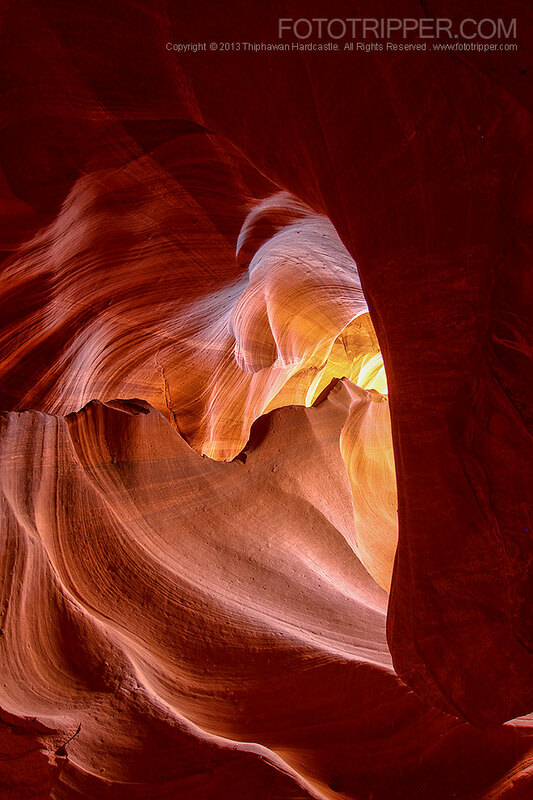 Upper Antelope Canyon in Page, Arizona offers some superb ‘Abstract Photography’ opportunities due to the mesmerizing sandstone rock formations. The scenery there is so spectacular that you might forget to look up, in which case you’ll miss some of the most amazing abstract shapes that nature has carved out ready for you to capture. 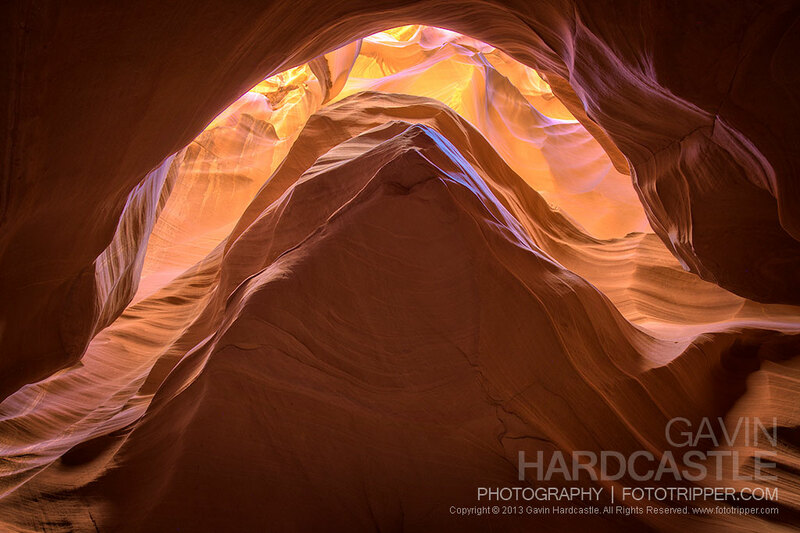 Here is the second part of my Antelope Canyon Photo Guide for Abstract Photography. 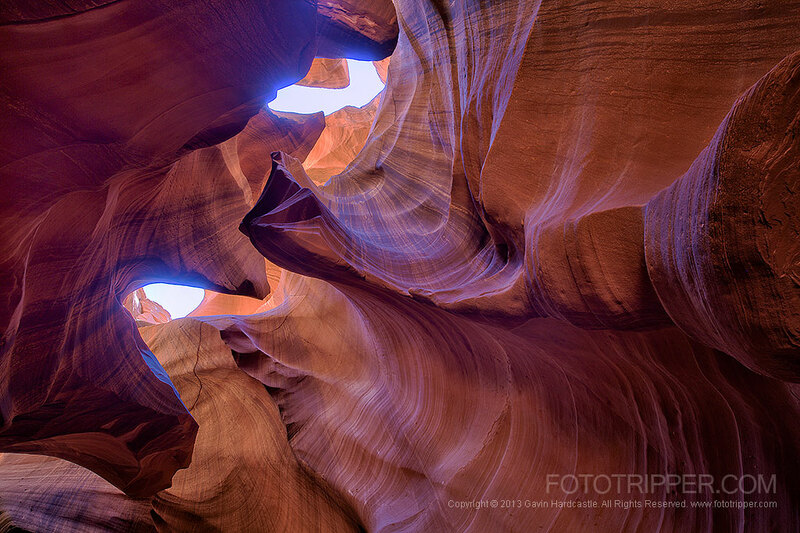 If you missed Part 1 be sure to read my Antelope Canyon Photo Tips on how to get the best ‘Scenic’ shots of Upper Antelope Canyon. I realize I just mentioned this but seriously, try to keep looking above your head as often as possible. Your Navajo guide will probably point out the obvious areas of interest but don’t rely solely on that. Your guide might also advise you not to get any sky in your shot so as to avoid blown out highlights but I’m telling you to IGNORE that advice so you can get shots like the one above. High Dynamic Range – If you plan on including the sky in your shots you’ll need to bracket and shoot many different exposures to capture the huge dynamic range and contrast of the canyon. You can use HDR software or manual exposure blending in Photoshop to fix blown out sky’s and dark black shadow areas. I recommend this technique for ALL of your abstract shots. ISO Settings – Try and keep it at ISO 100. If you read part 1 of my Antelope Canyon Photo Guide you’ll know that ISO 100 will slow you down too much for the scenic shots but for the abstract shots you won’t have to worry about people photo bombing your shots because usually the most fascinating shapes are up above head height. Use a Zoom Lens – These amazing rock formations might be 50 ft above your head, using a zoom allows you to dedicate all of your resolution to your point of interest and also excludes any human heads getting in your shot. Aperture Settings – Unless you are using the Focus Stacking in Photoshop technique you’ll want to choose an aperture setting in your lens’s sweet spot like F/11. This will allow plenty of ‘depth of field’ while still retaining sharpness. If you have a tilt-shift lens you’ll be in your element here. Focusing – With the abstract shots you’ll have more time so use your camera’s ‘Live View’ to focus manually on the most important part of your image. Remove Filters – Unless you absolutely have to use a polarizer for lets say ‘cloud definition’ I’d advise you remove it. Parts of the canyon get pretty dark and filters will slow down your shots. Go Portrait – Don’t forget to switch your camera to the portrait position and maybe even flip it upside down. 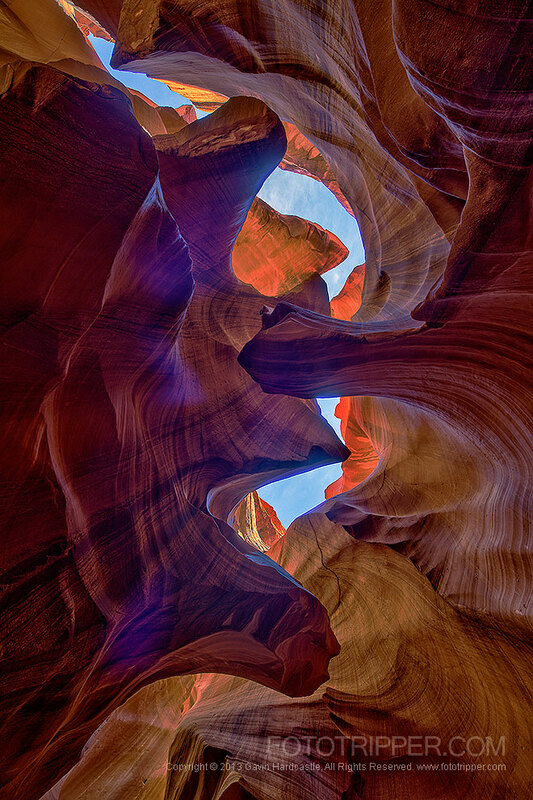 Some of those abstract canyon shapes come at all angles so if you have a flip viewfinder you’ll be feeling smug. I had more than one person bang my tripod legs and ruin my shots. If you expect this to happen you’ll be able to cope with it. I knew it would be something of a gong show so I was mentally prepared to deal with it. You’ll be sharing a small canyon with 200-400 photographers over a short period of time so keep cool. Most people are usually respectful and quite apologetic if they ruin your shot. Having been there just the once I’m pretty sure I missed out on lots of other amazing photo ops. Here’s how I would do it a second time. Dedicate one visit entirely to abstract photography and the other to the scenic photography. By doing it like that you can be in the exact OPPOSITE places to the crowds. While everybody is off shooting light rays you’ll be on the other side of the canyon shooting up into the walls and sky to get shots like this. Thanks Louise. I hope you get some stellar shots on your visit. I’m off to Page next month and booked with overland tours to shoot a few canyons. Your shots are amazing and really helpful tips – if I can get anywhere close to what you’ve achieved I’ll be very happy! Thanks Trisha. You won’t have to try very hard, it’s easy. Great photos. Heading to Antelope Canyon in September but had nearly discarded the idea due to reviews of not being able to get good shots on the tours i.e. too many people and guides taking cameras out of your hands. Did you take a normal tour or the photographers tour? Can you really get these photos on an ‘ordinary’ tour? We took a ‘Photo Tour’. The guides will be there to switch your white balance and push up your ISO if you don’t know how. I won’t have anyone mess with my camera so it wasn’t an issue for me. If you want to visit a world class scenic destination like this, there is no way to avoid the ‘too many people’ issue. We have just returned from Page. We toured with Adventurous Canyon Tours. The guide took us to Rattlesnake Canyon as well as Antelope Canyon. This company is the only one touring Rattlesnake. In my opinion, we got better pictures there AND our family group if six were the only ones there. When we got to Antelope Canyon there were a dozen tour groups and we found it very difficult to get a picture without somebody showing up in the pictures. I am going there in march and of course would like to take the tour, but I have a problem with it. It’s going to be 2 of us (wifey and me) and only me will take photos. Besides, I use micro43 gear (E-P5, which I carry along with no less than 5 lenses, tripod…) and I have seen warnings that mirrorless cameras are not allowed in “fotographer’s tour” whereas tripods are not allowed in std tours so, what to do? Don’t take the standard tour, that’s for iPad warriors. If you want serious shots go with a photographers tour and they’ll time all your best shots and won’t care what camera you use. If you’ve got a tripod, they can tell you’re serious. Wifey might prefer the standard tour though, it would cost less too. Thanks for all of the great information! Your site is my “goto” when taking a trip. I was just curious as to which canyon the very very top photo with the title was taken in? Thanks again! Hi Matthew. That would be Upper. Thanks a ton! Looking forward to future posts! If you were going to only to one canyon , upper or lower ? Best tour group ? Thank you and wonderful pictures . If you want light rays it has to be upper, but only at certain times of year. If you don’t care about light rays do lower any time of year. For upper I’ve only used ‘Overland Tours’ and they were fine. If I want to go to both upper and lower canyon,what time should I plan? Mid morning or mid aft. Great set of photographs !! U r good hands down!! Am planning to be there in the second week of Sept.
You mention the wide angle and the zoom lenses…. What are your recommendations? I have 16 35 f2.8 as well as 24 70 f2.8, do u think I will need both? I intend to be in Page on 15 and 16 February of this year. 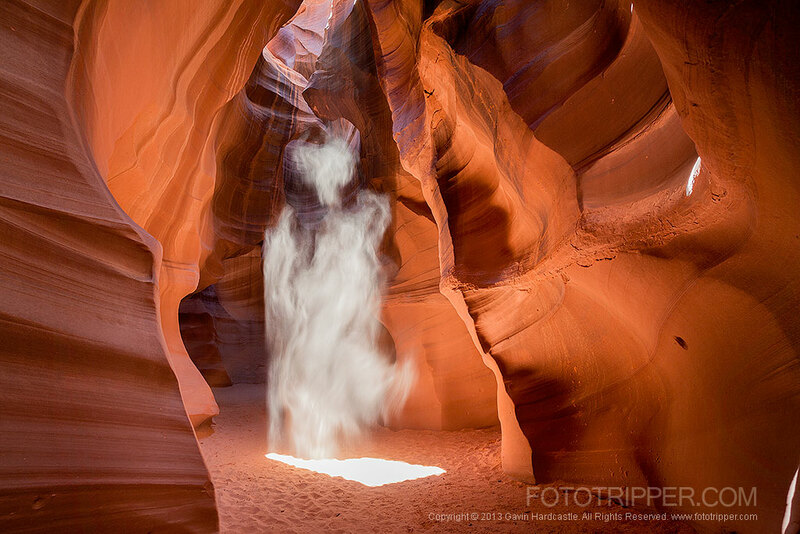 On 15 no tours are offering any photo tours to Upper Antelope Canyon that I presume are necessary for any meaningful photography. 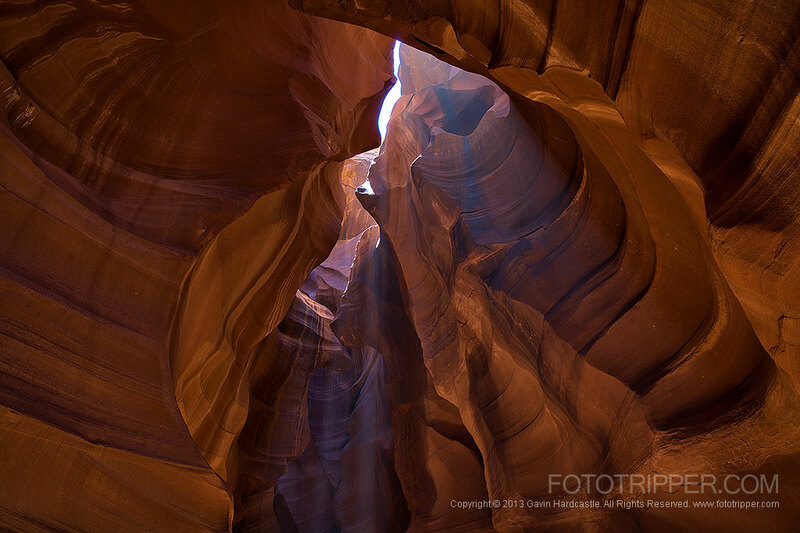 Can you suggest any alternate Slot Canyons nearby that are less crowded but offer good photography experience. I will be in Page the end of Dec. and the only tours available is either 8am or 3:30, for upper canyon. Which is better? Lower canyon has more opening, what is a good time? No photography tours available. Totally depends on if you want light rays or not. We’ve booked out Photography tour for the Upper Canyon, and I’m afraid my Canon Powershot SX50 HS wo0n;t be up to the task ahead. I’ve set my ISO to 320. Thanks, and you take awesome pics!!! I’ve no idea. It depends on the light you get that day.